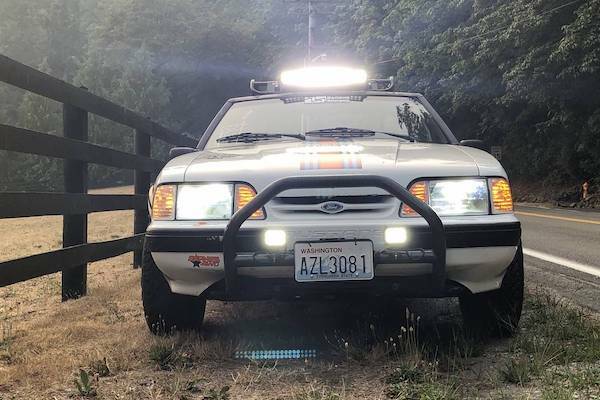 A Foxbody Ford Mustang that was converted into a mean off-roader has come up for sale in Washington, complete with pre-runner modifications to make any expedition a hoot. 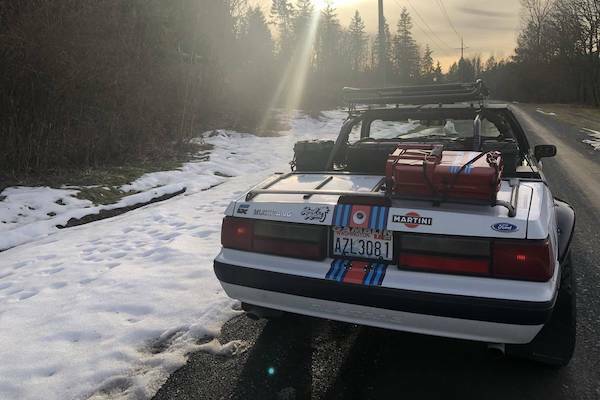 According to the vehicle's listing on Seattle, Washington's Craigslist site, this Mustang started out as a 1991 Mustang LX convertible, with a naturally aspirated 2.3-liter four-cylinder engine and an automatic transmission. 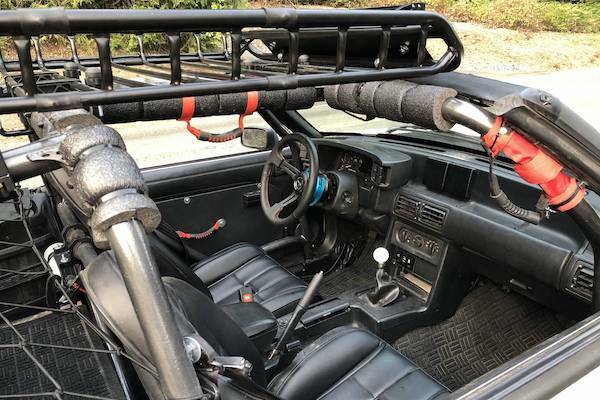 Unlike most Craigslist posters that insist their car's modifications are too extensive to list, this seller goes the full nine yards, listing every single tweak made to the car. They even have a URL for the car's build thread, where they explain that it was their wife that pressured them into turning this Foxbody into a pre-runner, rather than using another '68 Mustang shell like their other, 2JZ-GTE-swapped car. After excising its wheezing heart, the owner wedged the engine every Foxbody begs for: a 302-cubic-inch Ford V-8. Before installation, of course, this 5.0-liter was significantly modified; its cylinder heads were swapped for aluminum, GT40-style components, and further upgraded with an aftermarket camshaft, rockers, and valve springs. Easing the V-8's breathing are an Edelbrock intake, short-tube headers, and H-pipe exhaust. However much power this makes goes downstream through a five-speed manual, out an aluminum driveshaft, and into an 8.8-inch Ford rear axle, sourced from a 2001 "SN95" Mustang GT. But as established by tiny-but-mighty off-roaders like the Suzuki Jimny, the powertrain isn't what makes a prerunner. No, that's where this Mustang's heavy chassis modification comes into play. There's an eight-point roll cage, largely custom, to keep the insides of one's skull where they ought to be. 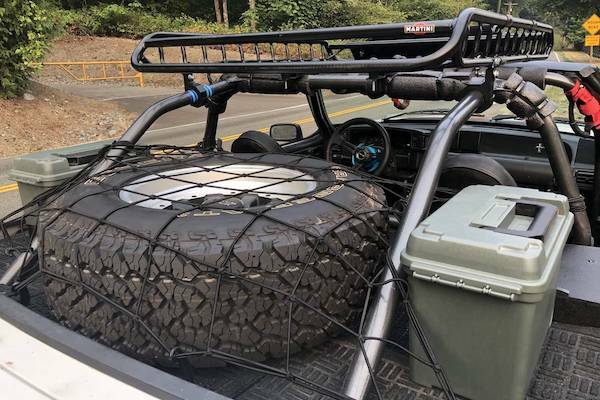 Strut tower braces and tubular subframe reinforcements help prevent the frame from bending while hopping around trails on its 1.5-inch lift and off-road shock absorbers. To address the not if, but when dilemma of getting dirt in this car's interior while on the trail, much of its cabin has been coated in bed liner. There's a bluetooth-linked sound system, a fire extinguisher, and a GPS speedometer (the mechanical unit doesn't work). For when there's snow on the ground, like in one of the photos above, the heater still works, as do the power windows. A sum of $5,500 takes this mildly mulletastic off-roader home. There are certainly more expensive ways to go off-roading in a car, and less legal things to do with a Mustang.